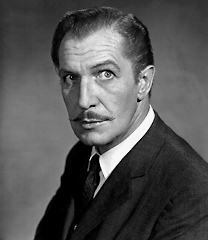 One of classic Hollywood's most famous scary men, Vincent Price played a few straight roles during his career but made a name for himself in classic mysteries and thrillers throughout the 1940's, 50's and 60's. Price played Shelby Carpenter in Otto Preminger's masterful film-noir crime mystery, LAURA (1944) featuring Gene Tierney, Dana Andrews, Clifton Webb, and Judith Anderson. It received five Oscar nominations and took home a statuette for its black-and-white cinematography. 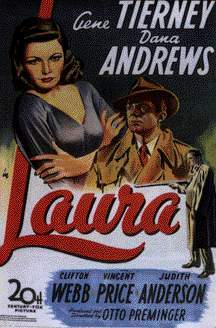 See the Original Trailer for LAURA (1944) (a 1.8 MB .MOV file courtesy AMC). A poster from LEAVE HER TO HEAVEN (1945), the third of four films in which Price starred with Gene Tierney. Winner of an Oscar for its Technicolor cinematography, this movie also featured Jeanne Crain, Gene Lockhart and a musical score by Alfred Newman. 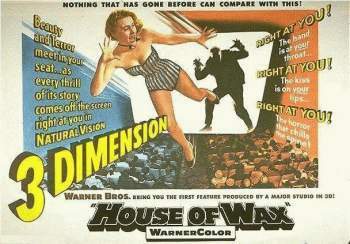 Possibly the most popular of the 1950's 3-D films, THE HOUSE OF WAX (1953) featured Price as Professor Henry Jarrod, a wheelchair-bound wax sculptor who gets a little help from human models. This fantastic chiller is still good today, even if you aren't able to see it in 3-D.